Need to scream a bit? I didn’t particularly feel the need to do so. 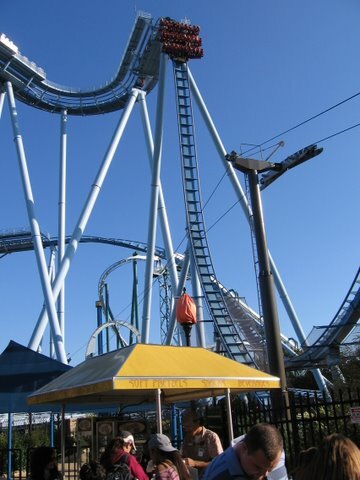 But when our adult daughter suggested that we drive down to Williamsburg, Virginia to join her for a day at Busch Gardens during the Halloween season, we took her up on it. We’re not much for theme parks, but if you have to go to a theme park then Busch Gardens during the off season is the place to go, particularly after 6 p.m. when they crank up the fog machines and the haunted houses open. My memories of theme parks usually involve three things: summer, sweat and long lines. Busch Gardens on an autumn Friday had temperatures in the sixties, no sweat and only modest lines to the various attractions. For someone not into theme parks, Busch Gardens was almost fun. Even the traffic cooperated. Amazingly, there were no traffic tie-ups or slowdowns on I-95 and I-64. This may be a first. I have a pathological hatred of Disney World, and was only reluctantly prodded to go there in 1996. I went on the insistence of my wife, who said our daughter “still has the magic” at age six to believe in the crap Disney was selling. I still have memories of trying to take her out on her first Halloween at age three. Her mother made her a beautiful Mary Poppins dress but Halloween proved too traumatic for her, so she observed it from the safety of her room. Now at age twenty-two, she is quite comfortable regressing to age six. I wondered if she was high on candy corn, so often was she tugging at our arms leading us into rides, shows and various haunted houses at the park. Busch Gardens is a right-sized theme park, neither too small nor too enormous, pretty, family-friendly and with plenty of screaming even when it was not the Halloween season. The screaming is provided year round, courtesy of the roller coasters at the park. If you ask me, riding some of those coasters after dark with about ten million fog machines cranked up to maximum was likely the scariest part of their “Howl-o-scream” weekend. When you watch some of their roller coasters in action, particularly the Griffin, you wonder why anyone in their right mind would get on one of those machines. They certainly make its occupants scream. Jeffrey Dahmer himself could not get more vitriolic screams out of his victims. The Griffin in particular is a feat of fright engineering: designed by sadistic engineers for masochists. Give me a funnel cake instead. Busch Gardens goes with a European theme, specifically a western European theme, and bad themes at that. Depending on what “country” you are in, you will get frequently annoying stereotypical music of that country ringing in your ears. Don’t you know there is nothing more to Germany than Bavaria? Moreover if you were to visit Bavaria, it would be 1920 or so, they would be all be in native dress and playing accordion music. And what’s with Handel’s Water Music in “England”? Yes, it was written for English royalty, but Handel was German. A map of the park was essential because signage was not great. I wondered how people made it out of the park when it closed at 10 p.m. with the lights so low and little in the way of directions. Maybe they were chased away by various assorted clowns and zombies. The highlight of our day was not the rides (some of which were converted into haunted houses), but the many shows you could take in instead, all near Broadway quality, all with a Halloween theme and all quite fun. Considering we paid about $50 each to get in (with discount coupons) we easily got our money’s worth, although Busch Gardens picked our wallets in other ways with parking fees ($13) and mediocre meals ($60 or so). One thing I can say for Busch Gardens is despite its somewhat kitschy “countries”, it is a beautiful theme park that manages to integrate nature rather well. Use lots of darkness and strobe lights. Enforce feelings of claustrophobia from time to time. One of them did it quite well by hanging plastic sheeting three to four feet above the ground. Have people in ghoulish costumes hoisting fake weapons appear randomly from dark corners or out of windows. Have those same people invade your personal space but not actually touch you. Use plenty of clowns if possible. There was a kind of “clown alley” where you were accosted by creepy clowns all very much in your face and not afraid to follow you. Who needs zombies when clowns are so much scarier? Make sure you run into things unexpectedly in the dark, particularly stringy stuff. Dirty toilets and urinals are okay. Go with a theme for each haunted house. I preferred the haunted house with the man-eating chicken and the bee man; now that’s creative. In truth I had more fun interacting with the performers than they had performing for me. I enjoyed giving them stink eyes and trying to get into their personal space. After all, where is the fright when you know they won’t actually do anything to you? In short, you may howl more from laughter than from fright, particularly if like me your heart medicine controls your heartbeat, so you know you won’t get an adrenaline rush. Still, altogether the Howl-o-scream is well worth the price of admission. However, if you demand lots of blood and guts in your haunted houses, better pick a more violent venue.